Below is a list of the most commonly asked questions together with our answers regarding Nordic Business Forum 2016. If you can’t find an answer to your question, feel free to contact us at info@nbforum.com or +358 20 775 1390. We are always happy to help you! 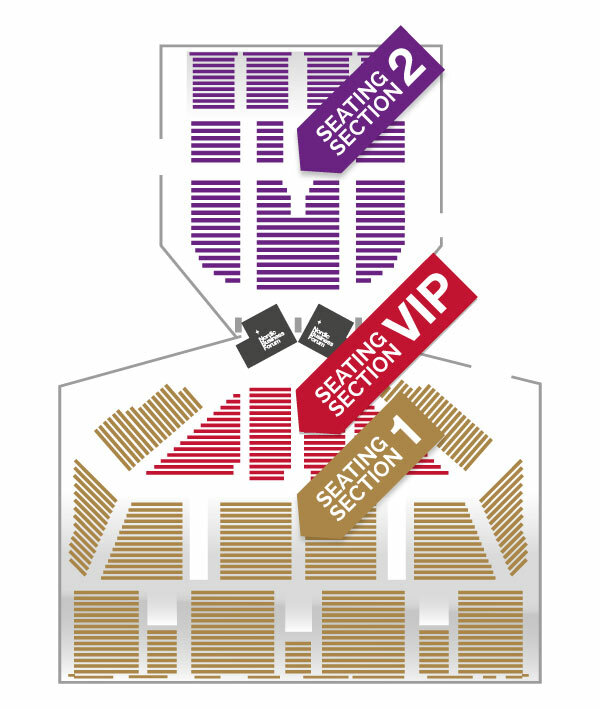 Q: What do Seating Section 1 and 2 mean and where are they located? A: The seminar hall is divided into two seating sections with the stage in the middle. VIP seating is located in the seating section 1. Great technique and huge screens offer all attendees a great view to the stage. Q: Can you send my company an invoice without VAT? A: No, VAT is always added to the ticket price even when the purchase is made by a company. When a company sells another company an admission to short-term educational, scientific, cultural and sports events, fairs and exhibitions and other similar kinds of events, and services that are immediately linked to the admission, the service is sold in Finland, if the event is held in Finland. When the service is sold in Finland, it is also taxed in Finland. (Applied from AVL 69 d §). As Nordic Business Forum 2016 is held in Finland, VAT is always added to the ticket price. A: We offer three payment methods: invoicing, online bank and credit card. The credit card and online bank options are provided by Paytrail. If you want an invoice, you can choose between printed invoice, email invoice, and e-invoice. Please provide us always with the correct invoicing information. For Russian customers, we also offer Russian invoice in Rubles and with the needed documents. A: The tickets will be delivered to you via email as a PDF attachment. A: You need to show the ticket at the event’s check-in desk when you collect your name badge. A: No. The tickets are not personal, nor do we print the attendee names on the tickets. When purchasing the ticket, the ticket is automatically allocated to the purchaser. We will send the purchaser a link through which they can change the attendee information closer to the event. A: Yes, the name and contact information of each attendee are to be sent 14 days before the event at the latest through our attendee dashboard. Q: I cannot attend, what can I do? A: You can always allocate the ticket to another person/party. Please edit the information of the new participant through your attendee dashboard or let us know at info@nbforum.com. Please note that according to the terms, it is not possible to change the person or organization liable for the payment. The tickets have a 30-day cancellation policy after receiving the ticket. Please note that the tickets received more than 30 days ago cannot be cancelled anymore. Q: Can I cancel my ticket(s)? A: You can cancel the ticket within 30 days after receiving the ticket(s). Always contact us at info@nbforum.com if you would like to cancel your ticket(s). Only written cancellations are accepted. Please note that an invoice left unpaid is not considered as a cancellation. Tickets received more than 30 days ago cannot be cancelled anymore. A: All the tickets include lunches and break snacks and beverages on both days. VIP tickets also include a standing dinner buffet on Thursday evening. A: If you have any special meal requests other than lactose-free or vegetarian, please inform us through your “registrant information dashboard” or let us know at info@nbforum.com by September 5th. Q: How should I dress for the seminar? A: There is no specific dress code, but business casual or smart casual is recommended. Q: Where can I find the attendee list? Q: What should I take with me to the seminar? A: Please take your ticket, personal identification and business cards with you. We will provide you with a notebook and pen for taking notes and a name badge for networking purposes.